Heat oven to 400°F. Heat 10-inch skillet over medium heat. Add oil and onion; cook about 5 minutes, stirring occasionally, until onion is softened and starting to brown. Reserve 1/2 cup mango. Stir remaining mango into onion. Cook 3 minutes, stirring frequently. Stir in marmalade, mustard, vinegar and soy sauce. Cook 2 to 3 minutes, stirring frequently, until mixture thickens and most of liquid is absorbed. Remove from heat; cool while preparing crust. Spray large cookie sheet with CRISCO® Original No-Stick Cooking Spray. Unroll pizza crust dough on cookie sheet; press dough into 15x10-inch rectangle. Bake 8 to 10 minutes or until edges just begin to brown. 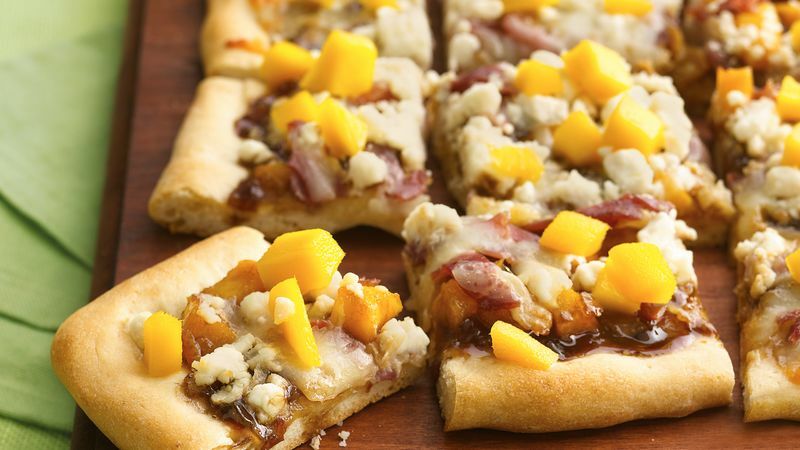 Spread mango-onion mixture over crust. Top with prosciutto; sprinkle with mozzarella cheese and goat cheese. Bake 8 to 10 minutes longer or until crust is golden brown and cheese is melted. Sprinkle with reserved 1/2 cup mango.